This section includes the years from 1980 until 1986. His albums stilled sold some copies throughout the ‘70s, but in the early ‘80s the sales went down. Althoug his albums weren’t a success he still toured with sold-out concerts. And in the mid ‘80s he started touring with three other great country musicians; Waylon Jennings, Willie Nelson and Kris Kristofferson. The group called themselves “The Highwaymen”, and released three hit albums; “Highwayman”, “Highwayman 2” and “The Road Goes on Forever”. The most famous song from this group had to be “Highwayman”, written by Jimmy Webb. After being kicked and critically wounded by an ostrige at his farm, Cash was admitted to a hospital. He suffered from serious abdominal pain, and recieved painkillers as a part of the treatment. These pills were addictive, and Cash was once again adiccted to drugs. But it didn’t last long. In 1986 he recovered at the Betty Ford Clinic. While recovering here, he became friends with Ozzy Osbourne, who happened to be there for the same reason as Cash. 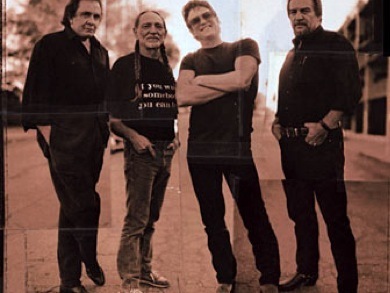 In 1988, Cash visited his friend Waylon Jennings in the hospital. Jennings was recovering from a heart attack. Waylon suggested to Cash that he had himself checked, and the doctors recommended preventive heart surgery. Cash underwent a double buypass surgery in the same hospital, and they both recovered. Cash refused to take painkillers, although they were prescribed to him. He wouldn’t go through another dependency. But it was under the surgery that Cash claims to have had a near death experience. He said he had visions of heaven that were so beautiful that he was angry when he woke up. And it wasn’t long after “Chicken in Black” that Cash and Columbia parted ways. In 1986 the 28 year long relationship was ended, but it didn’t end as well as it started. In 1986 John wrote his only novel called “Man in White”. The book is a fictional version of the life of Saul. John illustrates Saul’s life from oppostion to christianity to his conversion into the apostle Paul and also his missionary efforts.